Save time and money with a Gorlok Bucks meal plan. Gorlok Bucks are built for you! When you use them at Webster University Campus Dining locations, you save 10 percent on your purchases and those purchases are tax free. Combined, that’s over 18 percent in savings. Save time by eating on campus and never worry about losing your parking spot. 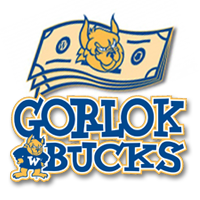 Add Gorlok Bucks to your Webster ID Card online. Learn more about Gorlok Bucks at websterdining.com. Campus Dining locations include Marletto’s Marketplace in Maria Hall, University Center Crossroads (featuring WOW Café, Sandella’s Flatbread Café, and Freshens Fresh Food Studio), the Cyber Café in Emerson Library featuring Kaldi’s Coffee, and Simply to Go located in the North wing of the East Academic Building. Gorlok Bucks can also be used at select off-campus locations in Webster Groves including Hotshots Sports Bar & Grill, Dairy Queen and Domino’s (delivery available).